Winter is upon us, and the South Carolina Department of Public Safety is urging people to stay safe on the road. 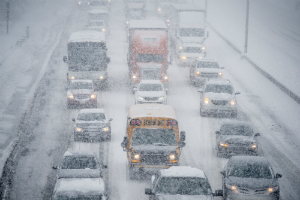 Below are some winter weather driving tips to help keep you and your family safe. 1. Check the driving conditions and weather reports before leaving home, especially if you are travelling long distances. 2. If there is any risk of driving in poor road conditions, make sure you allow yourself plenty of time to reach your destination. 3. If there are severe weather conditions, check for school and event closings to avoid unnecessary travel. 4. Make sure your vehicle has been serviced and is working properly. This includes checking your brakes, lights, seat belts, hoses, wipers and fluids. Keep your headlights on if skies are overcast or there is poor visibility. 5. Prepare an emergency kit for bad weather days. This should include a blanket, ice scraper, first aid kit, water, flashlight and fully charged cell phone. You can keep an extra coat, hat and gloves in your trunk in case you get stranded. 1. Slow Down - When driving in slick, icy or snowy roadways, it is important to keep more distance than usual between you and other vehicles, especially on bridges, overpasses and less-traveled roadways. Ice may be present even if you cannot see it. 2. Know how to Brake - Knowing how to brake can prevent skidding and spin-outs. With Anti-lock brakes, you can press the brake pedal and hold it steadily. If your brakes pulse, know that this is normal. If you have standard brakes, gently pump the brakes so that your wheel does not lock-up. 3. Use Electronic Stability Control - If your vehicle is equipped with this feature, it can assist you in controlling your vehicle if it loses traction. 4. Do not use Cruise Control - You will want to be able to control your car fully in winter weather, and you may have to adjust your speed frequently. 5. Learn to Get out of a Skid - If you start to skid, release your foot from the accelerator and counter steer. Do not slam on the brakes. You will want to steer in the direction that you want the front of your vehicle to go. The car accident lawyers at Harbin & Burnett remind drivers to remain safe this winter. If you have been injured due to another driver's negligence, we can help you recover compensation. Contact us today for a free consultation. Call 1(888)821-0247 today or fill out our free case evaluation form. No Cost To You, No Obligation. Contact Us Today. In many instances, most accidents are preventable. If you have suffered an injury due to the negligence of another motorist, you may be able to obtain financial compensation for your losses. Our team of attorneys can help you today. If you have suffered an injury due to the neglect of another individual or from a defective or dangerous product, we can help fight for your MAXIMUM injury compensation while you focus on the physical recovery process. The filing process for Social Security Disability benefits can be long and tedious, which often ends in rejection for most people. If you have had your first application rejected and need help refiling, contact our offices today. If you or someone that you know has suffered a serious injury while at work, that individual may be eligible to receive financial compensation. Call or email us today to learn more. No Attorney-Client Relationship Created by Use of this Website: Neither your receipt of information from this website, nor your use of this website to contact Harbin & Burnett, LLP or one of its attorneys creates an attorney-client relationship between you and Harbin & Burnett, LLP. Harbin & Burnett, LLP does not accept a new client without first investigating for possible conflicts of interests and obtaining a signed retainer. Therefore, you should not use this website to provide confidential information about a legal matter of yours to Harbin & Burnett, LLP. No Guarantee of Results: Many of the practice summaries and individual attorney biographies on this website may describe results obtained in matters handled for Harbin & Burnett, LLP clients. These descriptions are meant only to provide information about the activities and experience of our attorneys. They are not intended as a guarantee that the same or similar results can be obtained in every matter undertaken by our attorneys; and you should not assume that a similar result can be obtained in a legal matter of interest to you. The outcome of a particular matter can depend on a variety of factors – including the specific factual and legal circumstances, the ability of opposing counsel, and, often, unexpected developments beyond the control of any client or attorney. Fees and Costs: Harbin & Burnett, LLP handles civil cases on a contingency fee basis which mean there is no fee unless we recover. Attorneys fee based on total recovery before expenses deducted. Client is responsible for costs in addition to the contingency fee. Costs are deducted from the total amount of recovery after the contingency fee is calculated. Criminal cases and cases other than civil cases are not handled on a contingent fee basis.